Ten Fathom Ledge sits about 1 mile past the main reef line so it's further out. It's also appropriately named because unlike the some of the other popular Key West scuba diving spots, this one gets much deeper. The overall area averages between 25 and 50 feet in depth with a variety of interesting structures. However, at the oceanside of the reef, it rapidly drops to the ocean floor to about 130 feet. If you're diving in Key West, and choose this dive site, you'll find it has one big advantage. You have 3 features working together to create a more unusual Key West dive than you'd find at the other reefs. First, you have the benefit of greater depth which means a more interesting and complex dive. Second, once you've dropped off the wall, you're in more open territory. The ocean is now spread around you on 3 sides. Third, you have the advantage of the Gulf stream being nearby. This not only lets you drift dive along the wall, it keeps the water clean. 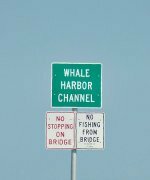 It also acts as a superhighway for the larger pelagic fish migrating through the area which can add some real interest to diving in Key West. At the shallower Florida Keys dive sites you're not going to see many, if any of the larger pelagic species. Out here at this greater depth, your chances are very good. Plus depending on the migratory season, you may end up seeing some very interesting specimens. Some of the bigger pelagic species that move through the Gulf stream are the fighting fish everyone dreams about. Marlin, sailfish, and mahi mahi all travel this route. Since you're near enough to their superhighway, there's always a chance you'll spot one or more of them as they move in search of food. You'll certainly see a greater variety of shark, along with barracuda, snapper, tuna, and larger grouper. 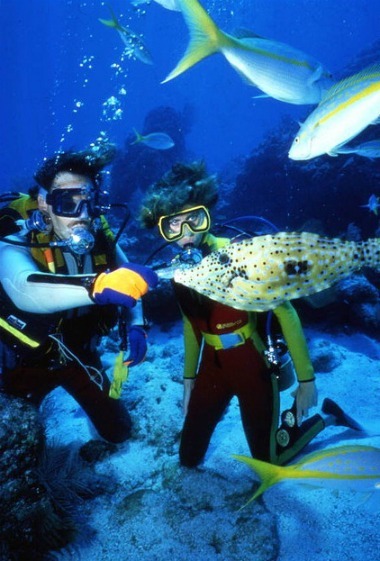 Structurally, this Key West scuba site also has a variety of interesting features you'll be able to explore. Before you make the descent down the wall, there are numerous caves, ridges, crevices, and caverns you can poke your head into. You'll likely see eels, lots of lobsters under the ledges, and grouper hiding out. The All Alone Wreck is also close by, and it sits just off the reef at about 90' in depth. It's hull is split open and you'll find that a wide variety of Florida fish move through the area including big grouper. With the wreck being so close to this very popular Key West dive site, you now have the added benefit of something else to explore. The Bar is perhaps one of the most important highlights of this Key West dive site. However, the whole area is filled with a variety of surprises, some of which aren't found anywhere else in the Lower Keys. Ten Fathom Ledge is totally unique, and that's the magnet drawing people to it.